Our Mission Statement: Grace Episcopal Church is a family of disciples joyfully reaching out in love to nurture, teach and heal in Jesus' name. What exactly does it mean to be Episcopalian? The word “episcopal” means “bishop,” a reminder that the Episcopal Church is one that has bishops as part of its structure. Bishops are mentioned in scripture, and their office was one of the earliest positions in the Church. Thus the Episcopal church maintains a strong tie to the earliest traditions of the Christian community. Yes, and no. The Episcopal Church is catholic in the sense that we maintain the ancient structure, like the Roman Catholic and Orthodox churches do. 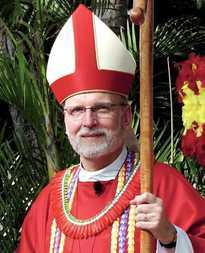 While we uphold the continuity of tradition, the Episcopal Church is not part of the Roman Catholic Church. The Episcopal Church is also Protestant, a product of the English Reformation back in the 16th Century. You can be both. The Anglican Church has always seen itself as the bridge church, valuing the tradition of the catholic side of the faith while asserting the authority of the scriptures, as the Protestant churches do. The Episcopal Church is the American part of the Anglican Communion, a worldwide body of churches, all with roots in the Church of England. 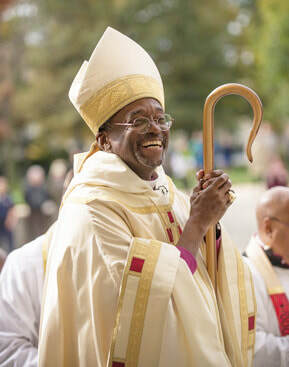 Many Anglicans are found in Africa (Archbishop Desmond Tutu of South Africa is one famous Anglican), Australia, Canada, and other parts of the former British Empire. What makes a church Anglican? History is part of it, obviously, but Anglican churches share much more in common. Anglican churches use a prayer book in their worship, written in the language of the people. Anglicans hold the historic Creeds (the Nicene and Apostles Creeds) to be sufficient statements of faith. Anglicans also see as essential the two sacraments of baptism and communion. The bishops of the Anglican Communion gather regularly, most notably every 10 years at the Lambeth Conference, hosted by the Archbishop of Canterbury. What do Anglicans stand for? What is unique in Anglicanism is our source of authority. Roman Catholics find their authority in the tradition, in the pope whose office gives him the authority to speak for all members of the Roman church. Many Protestants would maintain that scripture alone can be our guide. Yet scriptural interpretations can change – at one time, for example, most Christian churches believed that slavery was a divinely sanctioned institution. To these two sources of authority, scripture and tradition, Anglicans add a third: human reason. Our ability to reason, the insights of science and psychology – these are brought into conversation with the other two, that God’s will may be discerned. So where does the Episcopal church stand on the hot issues? Any who can reason are free in this church to make up their own minds. Consequently members of the Episcopal Church find themselves passionately on all sides of any issue. The Episcopal Church decides issues slowly, always with room for dissension. 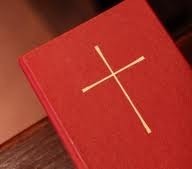 What does the Episcopal church believe about the Bible? Quite simply, for Episcopalians, Scripture contains all things necessary for salvation. This means that God has been fully revealed in the words of the Bible. We cannot add doctrines or rules that are not supported by Scripture. However, this does not mean that the Bible is inerrant, that is, without error, needing no translation or interpretation. The Word of God speaks to each age with a different emphasis, not a different message. We are in the process of learning each day what that Word means to us in our time. All of us, using our reasoning powers to the best of our ability, are part of the journey of discerning and doing God’s will. Why does the Episcopal Church use written prayers? While there is a place for spontaneous praying in our church, most worship services follow the book. The Book of Common Prayer is the product of centuries of Christian thought. While as modern people we often believe that newer is better, in the Episcopal Church we insist on valuing the insights of those who have come before us. Using written prayers ensures that we will not be limited to the concerns or insights of one particular worship leader of one particular community, but will be able to take advantage of the thoughts of countless believers. Written prayers broaden the scope of our prayers. The concepts contained in the Book of Common Prayer broaden our understanding of our faith. Aren’t prayers in a book less authentic than spontaneous prayer? Many worshippers believe this, not noticing that spontaneous prayers offered by a worship leader belong to that worship leader alone. The Book of Common Prayer allows all believers to enter into the prayer, putting their own thoughts into the words provided there. In this way worship is “common,” that is, it belongs to all the people. The priest or other leader speaks on behalf of the community, but the community members are very much a part of what is offered. Why does the Episcopal Church do the same thing each week? At the Last Supper Jesus said “Do this in remembrance of me,” thus instituting the particular Christian form of worship we call communion. For all Christians communion has a special place in worship precisely because it was commanded by Jesus. Episcopalians take this command very seriously when we celebrate communion each Sunday. Believing that the primary gathering of the community should have at its center the words and example of Jesus, we not only gather to hear the stories of Jesus, we also follow his example and commandment each Sunday. The Bible, which records God’s word to his people, assumes the existence of a believing community. Moses, David, Mary, Paul – even Jesus – lived out their faith in community. In our modern world we tend to believe that we can and should “go it alone,” but the truth is that we are meant to live, work and worship together. It is not an accident that the new commandment Jesus gives his disciples is to love one another. In attempting to do this we discover more about God and ourselves than we could ever know alone. Can’t you be Christian without joining a church? Certainly the beliefs of one’s heart matter more than fulfilling certain rituals. “I can pray just as well on the golf course,” a non-churchgoer will protest. True. The problem is, we rarely go to the golf course for the purpose of praying, nor are our souls transformed by the prayers we might offer there. Alone a believer can easily get lost, confusing one’s desires and thoughts for God’s. Alone it is easy to forget God’s presence or not recognize God. We grow in faith when we are challenged and supported by others trying to walk the same road. Yes, you can probably be a Christian without joining a church; it’s just twice as hard to do! For further exploration of the teaching of the Episcopal Church please look over the Church's Catechism: http://www.bcponline.org. By clicking on "The Catechism", you will be able to see the teachings and beliefs of the Episcopal Church articulated as an "Outline of the Faith." It is designed in an easy to review question and answer format. The founding fathers of the Episcopal Church were also the founding fathers of ourcountry, and the shield's red, white, and blue colors and layout are similar to that of the American flag. Red represents the blood Christ shed for us; white symbolizes purity, and blue is the traditional color of the Virgin Mary. The large red cross that divides the shield is a cross of St. George, the cross of the Church of England, that represents our ties to the mother church. The nine small crosses in the upper left quadrant represents the nine dioceses that founded the Episcopal Church in 1789, and are arranged in a St. Andrew's cross, the cross of the Church of Scotland. When no Anglican bishop would ordain a bishop for the new church in America, bishops of the Church of Scotland agreed to lay hands on Samuel Seabury, ordaining him the first bishop of the Episcopal Church. This cross honors the role that the Church of Scotland played in the birth of our church. 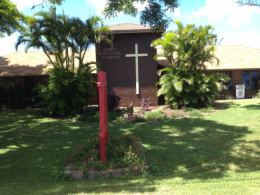 © 2014 Grace Episcopal Church Molokai Hawaii. All Rights Reserved.